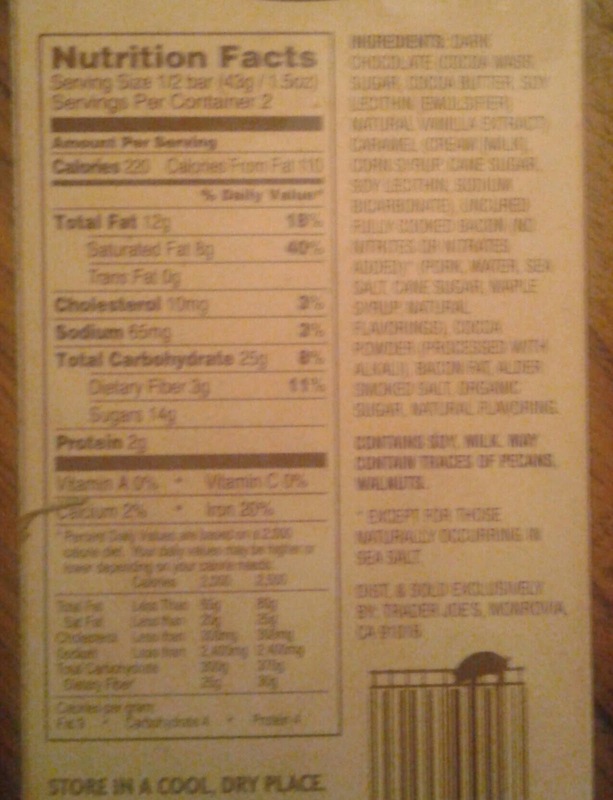 Whatever you do, do not buy Trader Joe's Uncured Bacon Ganache Bar. Instead, allow me to buy each and every one of them out there. Heck, for only $1.99 each, it's at least a somewhat dreamable way for me to utilize the extra bedroom. Believe me, this would be a service to all of you out there, because in all seriousness, there's only two viable outcomes. You will either: 1) fall totally in love with this candy bar, ruining all others for you for now and ever more, or 2) be totally and completely repulsed by them. I'm in the first camp, in case that'd be a surprise to any of you. Once I caught wind of these, I knew I had to make a special trip to TJ's just to procure a handful for me, Sandy, and my coworkers to testdrive, and first chance I did, I skeedaddled right on over. As among the first tasters (as of the time of writing this review, the bars have been available for less than 48 hours), I'm going to guess that these bacon boys will be a true love or hate item, with very few folks in the middle. Bacon and chocolate have been a known combo on the festival/flea market food circuit for years, but this is truly a unique item as far as I can tell. Here's what I like: First, the dark chocolate. 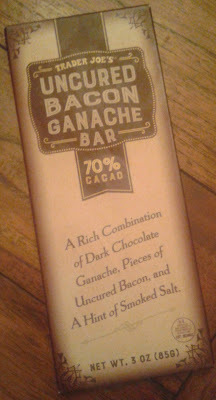 Most bacon/cocoa combos feature milk chocolate instead of dark, in order to play up the sweet/salty dichotomy. While generally I prefer even darker chocolate, 70% is still pretty nib-laden, and goes more for the savory jugular. Love it - it's about time someone pulled it off. Also, the "hint of smoked salt" - it's alderwood smoked salt, at that. That's a pretty nifty little touch that adds a great flourish at the end of the bite to make each nibble even that much more decadent. What's going to make or break the bacon bar for you is the ganache filling. My original photo didn't do a great job capturing it, so here's a great one courtesy of Facebook superfan Amarantha Medici - each square there's a goopy, caramel-y ganache reservoir that remained soft and fluid even after chilling it in the firdge for over an hour. It's also where the bacon resides, but taste carefully. There's little itty bitty bacon shards, adding a slight, occasionally granule-y crunch, but that's not quite it, either - it's more baconlicious than that. After a few tastes and consulting the ingredients list, it became apparent to me what it is - bacon fat. 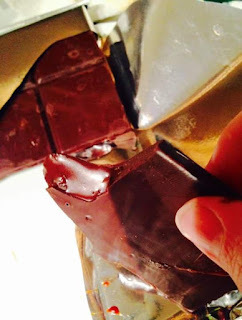 Chocolate ganache, after all, is basically chocolate, cream and butter - replace the butter with bacon fat, did we? I think so. The result? In my estimation, there's a well balanced flavor all the way through - savory dark chocolate, a little salt, a little smokiness, with some bacon undertones that hold it all together without overpowering it all. I had some coworkers try it, though, and some were outright repulsed, stating it was too bacon-y/too weird/too out there. There was more love than hate - one of them called his bite "piggy crack", while another one cracked a smile and declared his unabated happiness for the first time in three years I've known him, but I did get a few pretty adamant thumbs down as well. As for Sandy....she'll be one of the few in the middle, I think. "It's not bad, but I wish this were more like a Nestle Crunch, with bigger bits of crunchy bacon, instead of like a Caramello," she said. I agree, more crunch would have been a welcome addition...but I really, really like how the flavors all came together that it's hard for me to argue too ardently. I haven't been this excited about a debut of a new Trader Joe's product in possibly all of eternity, and by in large, the bacon bar lived up to the hype I made up in my mind. I'm going 4.5, while the wife is going a few notches below. YUM! I should give it a try. Why haven't TJ's attempted a cookie butter yogurt yet? Or cookie butter ice cream topping like a brittle. Cookie butter cupcakes. cookie butter cake, and cookie butter filled cookies. I like the way you think. You need a job in product development...or even better...once constitutionally eligible, you and I should run for president on the Cookie Butter platform. Speculoos in every form for all! Tried this today and it is 0 for 2 in our family. We enjoy dark chocolate. We love bacon, but this bar did absolutely nothing for us. I just need to find about 8 more people who would like to try a square so that I can finally get rid of the rest of it. On the other hand, the spring milk cheddar (or whatever it was called) was absolutely fabulous and we are working on our second brick of it, That was a totally awesome pick and we look forward to it hopefully showing up on the shelves again next spring. It treated like dog food dipped in pretty decent chocolate. Tried this a bit back and on the fence. Found it quite intense. I probably would of been good at a square or two but they didn't break well so I had this gooey mess that I felt obliged to finish. Seriously considering emailing them and asking if the can make it in individual squares.